Head towards the end of the page and click on the Windows x86-64 executable installer link. After starting the executable you will get an wizard. Make sure it looks like this and click on the red area to continue. Setup wizard with the checkboxes enabled. 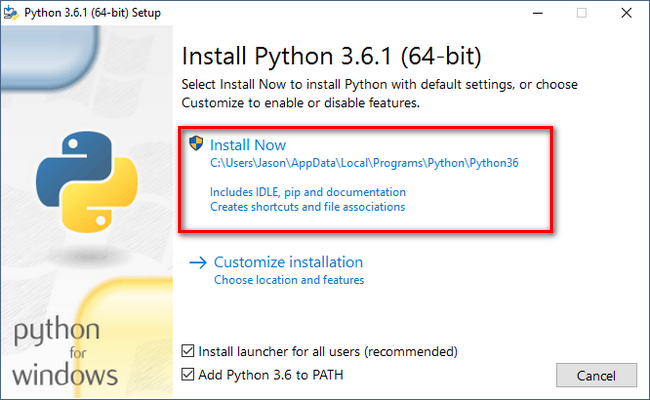 Make sure you checked the two checkboxes: Install launcher for all users and Add Python to PATH . To prevent the usage of the administration leverage and to benefit from multiple PyPlanet installations and a clean environment we recommend to setup a Virtual Environment. First of all we need to install the virtualenv package. To do so, open a terminal screen by hitting start and write cmd. Open the command prompt. After this we will initiate the environment, you can do this by going to your directory where you want to setup the PyPlanet installation. Create a folder somewhere that is empty and ready for the PyPlanet settings and other files. Open a terminal in this folder by holding SHIFT and Right click on an empty space in the folder. Then click Open terminal here. PyPlanet is published through the Python Package Index (PyPi) and is easy to install with the pip commands. After installing it on your system you can use the pyplanet cli commands. To get help about commands, use pyplanet help. After installing PyPlanet on your system, you can’t yet start any instances because starting requires you to give up an settings module. You could either provide this with the start command or create a project directory with skeleton files. We recommend using the init_project command to create a local project installation where you can install apps, keep PyPlanet and it’s apps up-to-date, provide settings through a useful settings module and provide manage.py as a wrapper so you never have to manually provide your settings module. After setup your project, you have to install or update your dependencies from your local requirements.txt. To upgrade your existing installation, see our Upgrading Guide. If you use the virtual environment we installed in 3. Create environment for your installation, make sure you activate it before you install or update dependencies! Configure your PyPlanet installation now by going to the next chapter: Configuring PyPlanet.